Last night, a new Overwatch map appeared, more or less out of nowhere. The FPS’ new assault map, Paris, arrived on the PTR with little to no fanfare, and it’s taken players no time at all to discover some of the new location’s easter eggs. Chief among those easter eggs are the pianos. Paris begins in a cabaret, and from there, you’ll be battling your way down artisanal alleyways and the banks of the Seine. Hidden throughout the map are several of the aforementioned musical instruments, all of which are can be played by even the most ham-fisted heroes. The map arrived on the PTR last night, and it didn’t take players very long at all to discover that they could play the pianos. All you need to do is line up a shot at the note you want to play, and fire. From there, you can string a few notes together, so it’s no surprise that players were soon recreating entire tunes, while never even leaving the game. I’ve seen Zarya playing ‘Mary had a Little Lamb’ and ‘Twinkle Twinkle Little Star’, but my personal favourite offering so far comes from Telenstac, who posted Soldier 76’s rendition of Undertale’s iconic Megalovania theme. You can check it out below. I’d imagine pulling this off is easier for precision characters like Widowmaker or Tracer than for those characters who utilise something of a scatter-shot approach. Reinhardt and Roadhog are unsurprisingly absent from the musical efforts I’ve seen so far – I imagine playing piano with a shotgun can’t be easy. 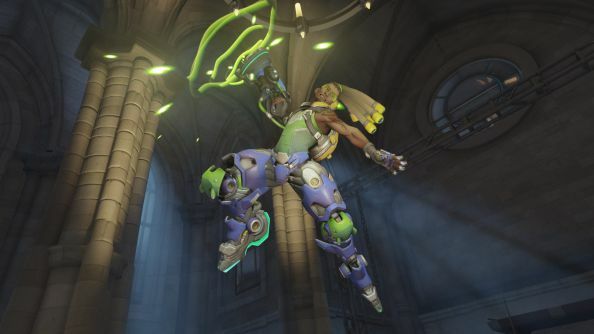 For some reason though, I’m yet to see Lucio turn up either. While the map is currently live on the PTR, we don’t have a release date for it just yet. Given the Valentine’s Day theme of the artwork we’ve seen so far, and the traditional timeframe for new maps, however, I’d imagine it’ll make its way to live in a couple of weeks’ time. Which gives you plenty of time to practice.